This project started out about two years ago as something to keep me sane and calm whilst trying to get my two little girls to sleep. I spent hours and hours sitting and stitching as they battled and raged against sleep. Thankfully we have now passed this phase and I have been slowly but surely adding these little hexies together whenever I have a few minutes. 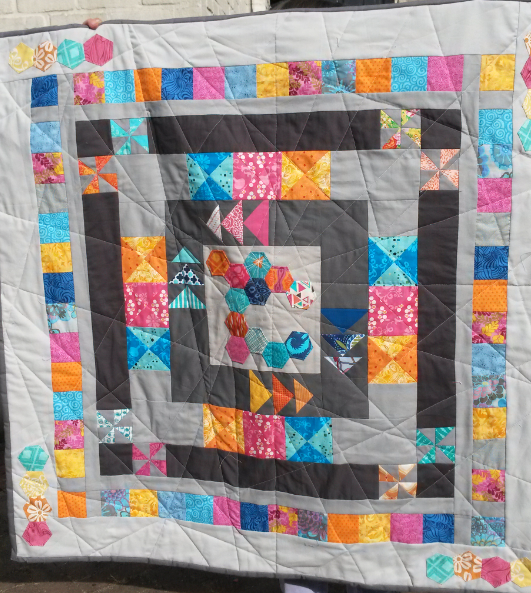 I am aiming for a lap size quilt and I am not too far off. My husband says I am mad but hey I still think it is keeping me sane! Part of expat life is the steady flow of people leaving and arriving. It keeps you on your toes and means that you meet loads of different people. It is also an excuse to make quilts for friends (we all know quilts make great leaving presents). 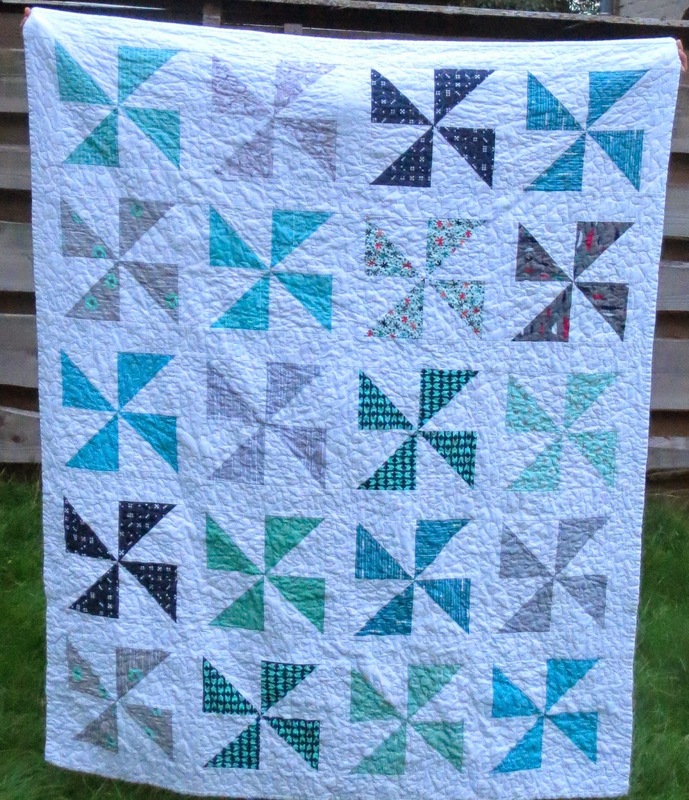 One of my good friends has just moved to the US and I wanted her to have a quilt, but with only two weeks notice it had to be a quick one! She loves aqua and teals so I went for a very cool colour palette, mixing teals, aquas and greys. To quilt it I did an all over stipple. It was quick and easy and I really love the texture it created. It is now in its new home in the US. 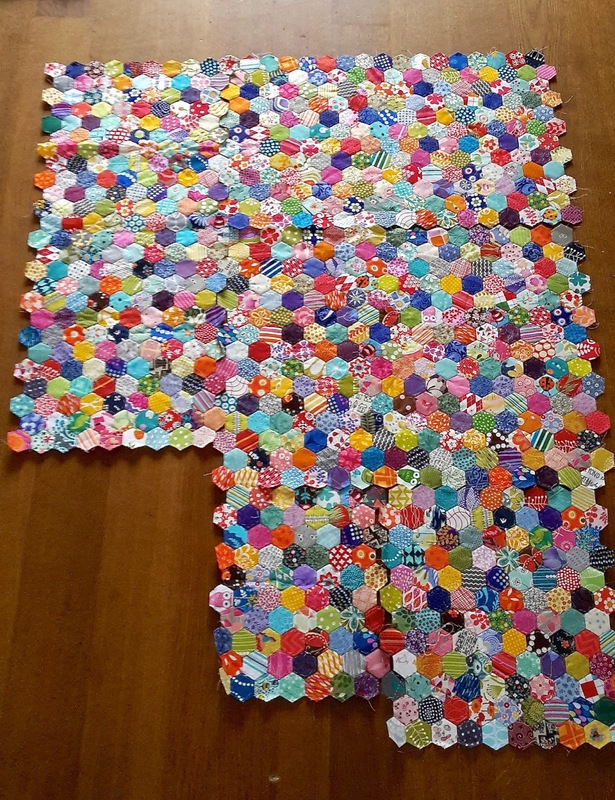 I started these hexies over Christmas. They remind me of winter in Finland. I am missing the snow and ice right now! I think I shall add in some navy blues and make it into a winter cushion cover. Well long time no see. Things have been busy here as we all settle into this new country and new routines. 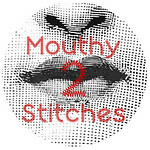 It has been tough at times but we do seem to be getting there now and I have managed to do some sewing. 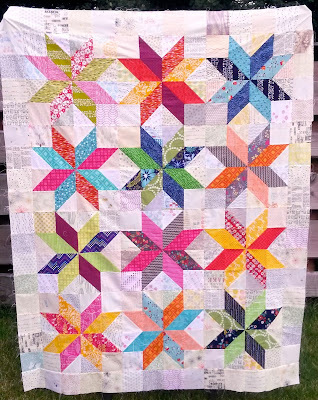 I finished my scrappy star quilt last week and am really pleased with how it has turned out. 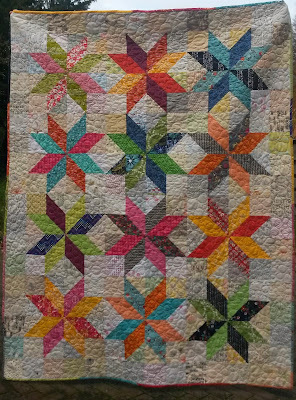 I pushed myself out of my comfort zone for the quilting and did some bubbles. Lets just say they are organic! They do give a lovely texture though. I bound it with fabric left over from the stars. 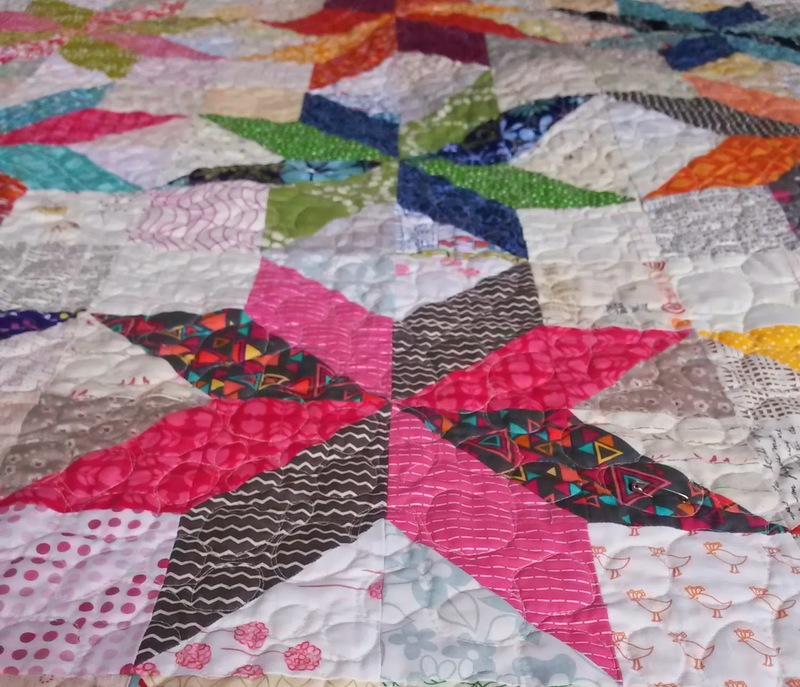 It truly is a scrappy quilt! It is now headed off to my sister for Christmas. 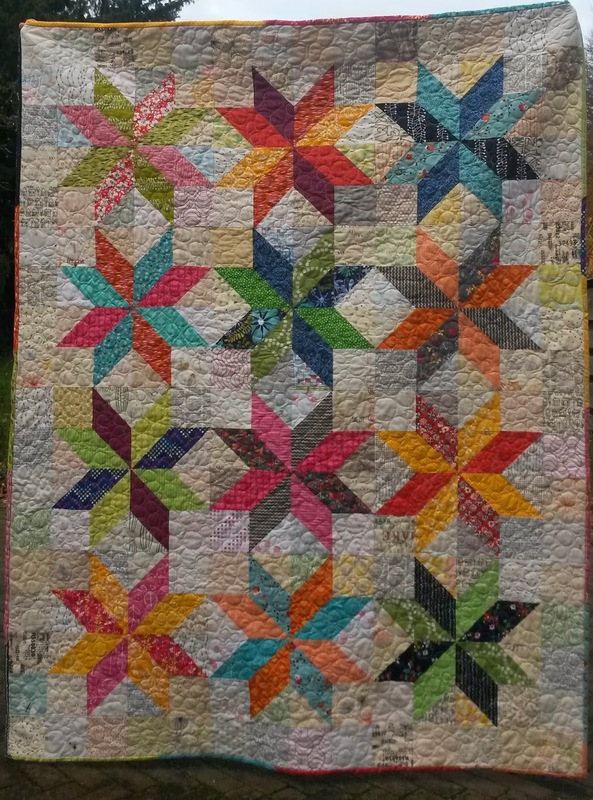 Today I finished my low volume stars quilt top. I really enjoyed putting this one together, particularly playing with the low volume charms. I also think I am finally getting the hang of half square triangles and even trimming them was not too bad! I decided not to sash between the stars, primarily because I had no idea what to sash them with. But I am pleased with how they have turned out. 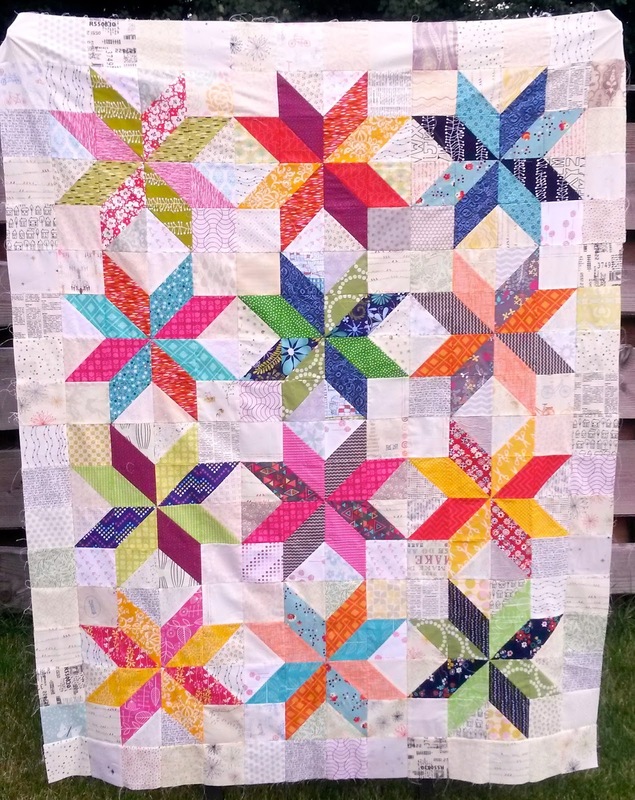 I just need to find somewhere to buy batting now and decide how to quilt it! Last year I was lucky enough to sign up for the Pay it Forward that Catherine at Knotted Cotton was running on her blog. Just before we left Finland my fabulous gifts arrived. There were squeals of delight I can tell you. Look what I got! A lovely drawstring bag filled with gorgeous bunting. The bag is currently holding my hexies and I am going to have to fight two small girls for the bunting! Catherine also sent some fabric goodies (including some of my most favourite Just Wing It by Momo) and some tea (a precious commodity when living away from home). Thank you Catherine. Your gift put a big smile on my face at a time when things were really stressful and rather crazy. As part of the PiF rules I am now going to offer to make 3 people a little gift. It will be a surprise and it's arrival will also be a surprise but will be within the next year. If you would like to participate please leave a comment saying you do. So we made it to the Netherlands. We are settling in ok, it doesn't quite feel like home yet but it will do. It is so lovely all four of us being back together again as a family. The girls and I are mastering the buses and there is a fab ice cream parlour opposite the house. Just need to learn some Dutch now! Way back in January I joined the Modern Mini Mystery Round Robin that Michele from Quilts from my Crayon Box was hosting. In a group of 5 other fabulous ladies, I sent off my centre block and duly received their blocks to add to. 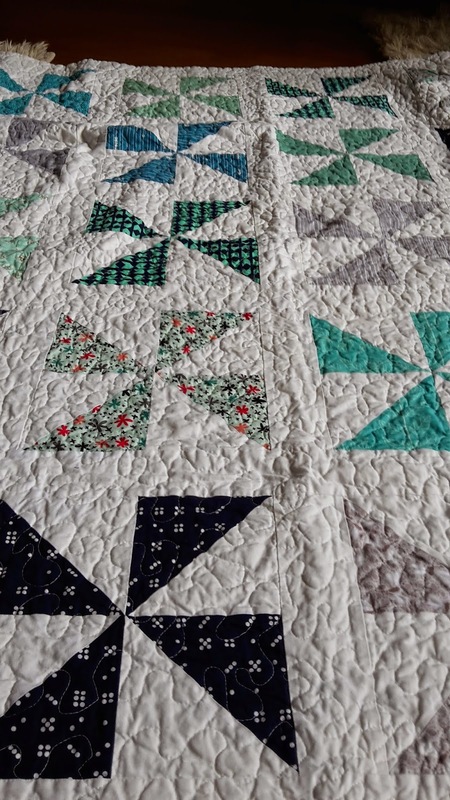 Everything was kept secret and none of us knew what was being added to our quilts. This is what I sent off. Just before we left Finland my mini quilt came back to me. I was gobsmacked when I saw it. I love it. As soon as my sewing machine arrived I quilted it with random straight(ish) lines. It now has pride of place in our living room. I feel really privileged to have been part of this round robin. I want to thank every one of the ladies that have worked on this quilt and made me something so beautiful. Thank you. Hello, welcome to my blog. I love fabric, sewing and quilting. 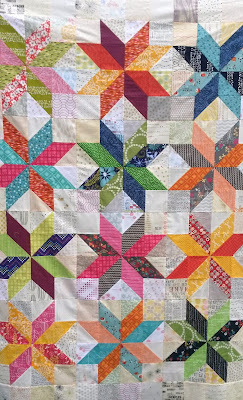 I am hoping this blog will document my adventures in quilting and all things fabric.